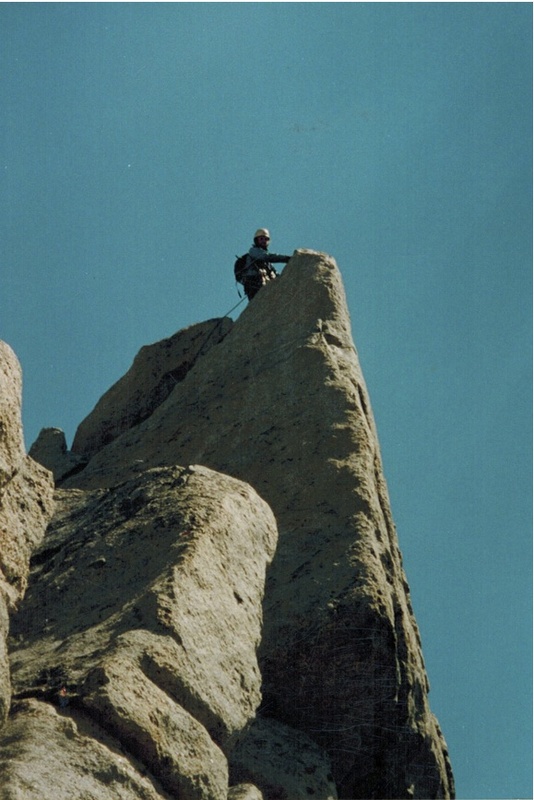 The following is an essay that I wrote shortly after returning from my first NOLS course as an instructor. I am posting it here, today in remembrance of the events of 14 years ago. I returned to a world not the same before I even returned. Walking in from the wilderness, coming in, I am never the same. Wildlands and climbing have a profound effect on me. When I am in town, my thoughts and emotions rise and fall like an eagle on a thermal, ebb and flow like the tide. In the wilderness, and when climbing, my mind is centered. I am in the here and now, not the later and there. I am in the moment, feeling the rock under my hands, rough, yet solid. I pull down. I feel the quiver in my ice ax when a solid swing plants into the ice. I feel the cold on my face, taste the cayenne in the hashbrowns. Each moment is savored like an orange from a resupply. I take nothing for granted, yet I take it all in stride. I’ve been in the back-country enough to know that life goes on while I am away. I accept that things change and I block out “that other world” but no one is fully protected. I remember the afternoon of September 12, 2001 with startling clarity. Thick alto stratus clouds made the sky gray. The mountains allied this tone and appeared dark and foreboding. The air was calm and settled, even on the mountainside. None the less our spirits were high as we descended from the peak. A few hundred vertical feet of 3rd class brought us to the col. We descended a fixed line, did a quick rap over the bergschrund and from there the going was easy. It was early afternoon. We had climbed efficiently and were prepared to reap the reward of an afternoon hanging out in camp. As we picked our way down a steep morainal slope we spied a man, a nameless, faceless man, sitting like a statue. He was perched on a boulder between our camp and us. We were high, excited. He asked us if we had a world band radio, then if we had any weed. Then he asked if we had heard the news. We replied that we had not. He told us. We stood in disbelief, dumbfounded, as he staggered down the moraine towards his friends. We sat hushed, not knowing or comprehending what we had just heard. “Why?” was only thought running through my mind. My climbing partner’s sister worked in downtown Manhattan. I can’t imagine what was going through her mind. I cracked a joke. I always do. My mind left. How can debriefing or a dinner be important knowing that 6,000 people (such is the information we had just heard) had just died and my country is on the brink of war? Walking is hard. All you really do is have incredible amounts of time to think. Climbing focuses me. Walking undoes that focus. Twenty-two miles of walking and thinking lay between us and the trailhead. I became away. I lost my ability to be here and now. I felt betrayed; someone had played a trick. Ignorance is bliss. My mind screamed for information, for a working phone, computer, newspaper, television, anything. I needed news. Reaching the summit of Nylon Peak, Wind River Range, on my first course as a NOLS instructor. September 2001. I am an outdoor educator and I rely heavily on experience to teach lessons to my students. For those eight hours, as I watched them top out on the couloir, ascend Warren, and drop down through Elsie Col, I relearned and lived two lessons. They smacked me in the face. Each moment, each day, each hour is such a gift. “How many times do I need to relearn this lesson?” I thought as I watched two blue glows descend across the cirque. My eight hours there were not wasted. I thought of the joy, lightheartedness, and pride we had as we descended. It is gone now, but I will forever hold that moment in my heart and in my mind, knowing that it was my fall from ignorance. All across the world people knew of these events before even one half hour had passed. People’s work days stopped; lives changed; priorities changed. On September 11, 2001 at 6:48 am MDT I was with three students on a short 3rd class scramble across a waterfall at the base of the Gooseneck Glacier. We didn’t have a clue. A day and a half later when we heard the news I thought about being thankful for what we, as individuals, are given. Each of us in our group was given an extra 30 hours of life, of wilderness, uninterrupted, thirty hours more than most of the rest of the world. I am thankful for that. I write and ponder my future. Outdoor education is so trivial in these trying times. I continue to climb and seek mountains yet I find it hard to go into the backcountry. I feel guilty, indulging and enjoying myself. My mind can’t stay focused; I want to know too much. Instead of longer trips into the wilderness and backcountry, I find my weeks filled with short trips to the local ledges. As I make the drive, NPR keeps me up to date on the news. At the belay ledge, with beautiful fall colors all across the valley, I think about hardships, war, and Afghanistan. I feel guilty. I ask what can I do? What is needed of me? When, for that valuable moment though, my mind slips and focuses on what I am doing, I become at ease with who I am. I know that for that small instance I was doing something for my country; I was living my life, uninterrupted. A little bit less of a nomad now, Jared still likes to refer to himself in the third person.